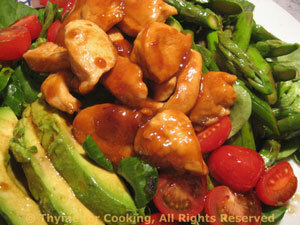 Dinner tonight: Chicken, Asparagus and Avocado Salad. I used spinach and mâche or lamb's lettuce for this salad, but use whatever looks good in your market. Add any other vegetables lurking in the fridge, and serve bread or fruit.